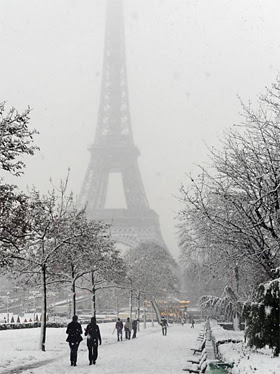 As Jessica and I were planning for our January Market, we imaged a snowy Paris: crisp, muffled, white and sparkly. And a time of inner reflection, creativity, coziness and tranquility after a busy holiday season. Perhaps you can sense it, but you may not see it! Although Wisconsin looks nothing like we imagined it would this time of year, we none-the-less hope to use our January Winter Delights for Winter Doldrums market to convey our sentiments. So, lets enjoy the warmer than usual January together! Our wintry market will focus on craft kits, vintage craft ephemera from Paris (old, but new to you), craft supplies and craft classes. We have also gathered a beautiful collection of milk glass, Valentine Day gifts and we are so excited to premiere some new product lines! On Thursday January 12 from 5-8:00 pm Nuit Blanche will begin our market weekend with glistening wintry-white and Valentine displays and the traditional glass of complementary wine. We will continue on Friday January 13 from 11-2:00. Then we will celebrate the Confectionique-version of Epiphany on Saturday January 14 from 10:00-4:00 and finishing off our Sunday with piping hot cafe from 12:00-4:00. We have a craft table taking center stage as we present a festive setting of creativity and as we prepare to gather for some crafting camaraderie in the latter part of January. We look forward to seeing you.